This weekend it was the long trip to Rhyd y Felin or Bala as most people know it. Forecast was rain which always makes the Bala track even tougher. 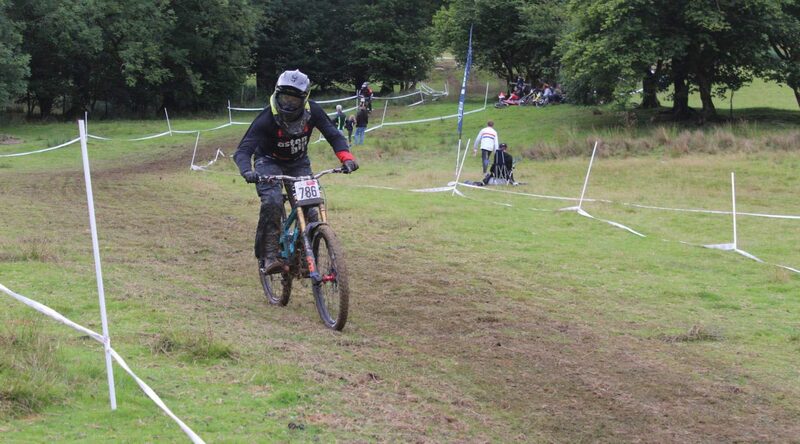 It was the same track that Pearce cycles had used for their race, albeit with a small change at the top and taped slightly different in the bottom field. Saturday practice was dry, and the track was grippy from the recent rain. The Pearce uplift ran like clockwork so there were no delays and there was chance for plenty of runs. Joe, Josh and Jeremy were loving the track and were all using the new Michelin Enduro front and rear tires. Towards the end of Saturday practice the rain came and it continued into the night and the next morning. This turned the track into a mud fest with conditions in the bottom field almost impossible to stay on the bike. 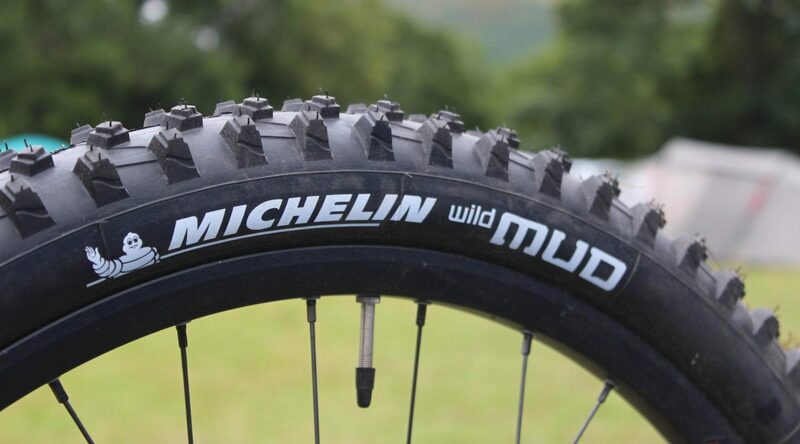 A swift change to Michelin Wild Mud tires was now needed and it was a Mudhugger race to keep the vision clear. Saturday morning the track was a bit greasy in places and slippy, but soon after the sun came up conditions were on point. I got in plenty of practice and was feeling good for Sunday. Just as practice was coming to an end the rain came in and rained till the early hours of the next morning. It totally changed the conditions. I felt a bit nervous not knowing what the track would be like after the rain. I was only able to get one practice run in on Sunday, but it was clean and gave me an idea of the conditions. Seeding run was not good with many mistakes throughout and a crash in the bottom field. Putting that behind me I was keen for the race run, which stared well, until a big mistake in the middle of the track and another crash at the end of the track. The weather made the weekend difficult but it was another invaluable weekend of practice on the bike. Looking forward to the next round at Bringewood! After missing the previous Pearce race due to injury, I was not sure how the shoulder would feel. All strapped and filled up with pain killers, my first run down felt OK. It was a little slippy on the slate up the top of the track, but I felt I could hold on and push down the track. I had the Cushcore fitted and this really helped with the grip, allowing low tire pressures, but also cushioning my shoulder. Managing the injury and not doing too many runs, I felt good and the grip from the Michelin tires was giving me so much confidence. Later in the afternoon the rain came, and it was time to call it a day. Sunday was a new day, but also a very wet one. Tires changed and due to a long delay, we were only allowed one practice run. The track felt OK, slippy in places, but not too muddy. Seeding time and with more rain I didn’t know what to expect. Good grip at the top of the track and entering the open section there wasn’t too much mud. But as I carried on down the track it became thicker. I made a small mistake and lost momentum causing me to catch every root and stump. 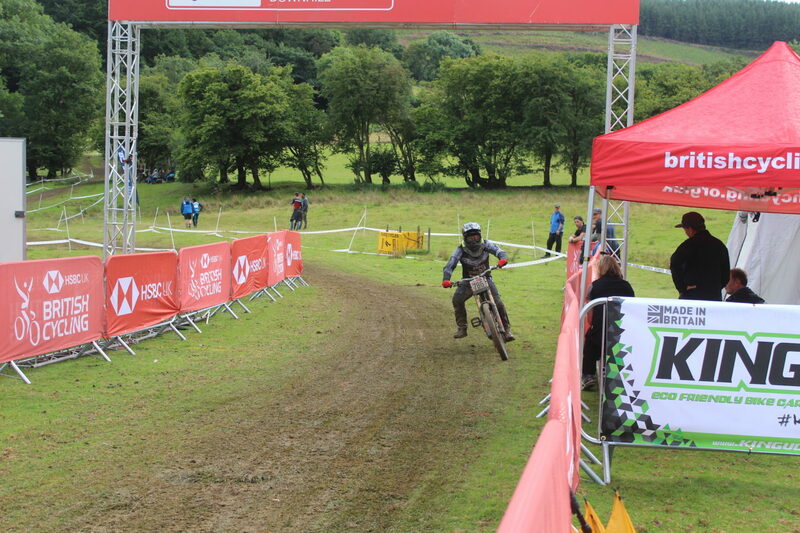 I survived the field section and finished in 5th which wasn’t too bad considering the run I had. Race time and with an injury to a young rider there was a long delay at the top of the track. 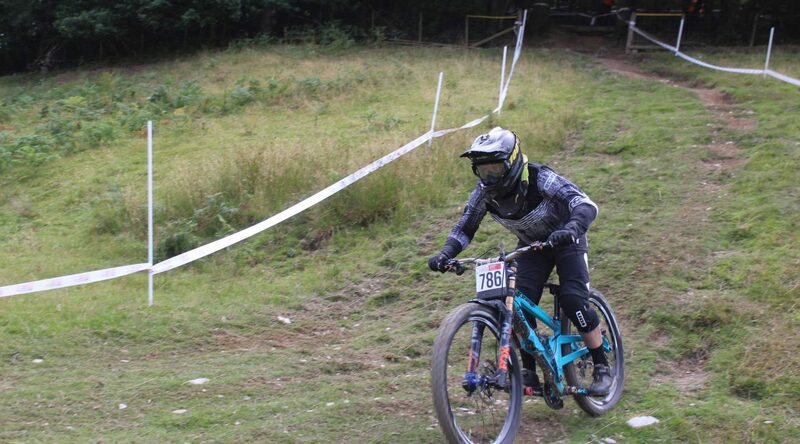 I came into the weekend feeling pretty beat up after crashing hard at Pearce the weekend before. But I was excited to race, as I enjoy the track at Bala. I felt relaxed and confident after a track walk as it was pretty much the same as the track we raced for Pearce a few weeks before. I chose to stick with the lines I had, and it meant I could relax in practice, rather than having to think too much about line choice. 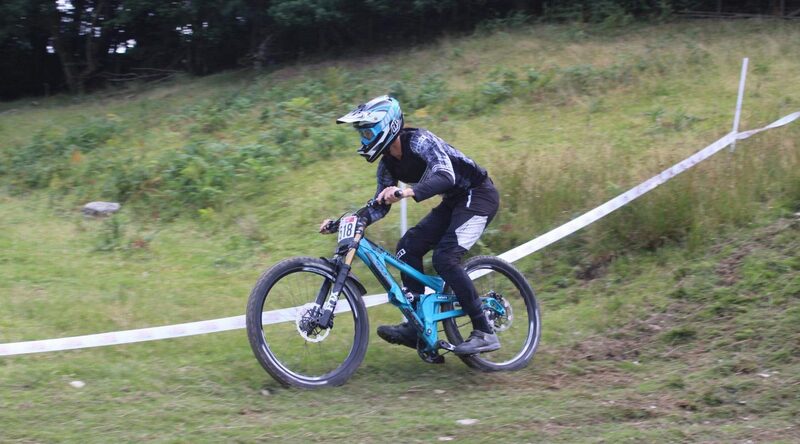 Conditions on Saturday were pretty good for practice, it was a bit greasy up the top, but middle was perfect. I felt I was riding quite cautious after my crash the weekend before and then having another one on my second run down. I took my time and chilled until I found I was up to speed. On Sunday morning we were told we were only allowed one run, so I waited until near the end of practice to go up as it had been raining all night. It was raining and sunny on and off all day which meant the track conditions were always changing. It rained whilst I was waiting for my seeding which made it hard to get a clean run down. I made a lot of mistakes and crashed in the middle of the track. I don’t worry too much about seeding as it doesn’t count towards my result, so I forgot about my run and focused on my race run. It hadn’t rained in a while before my run, so I was expecting the track to have dried out a bit which it did. I felt I was on a good run the whole way down and was 3rd at all the top splits. However, I came over the last fire road and washed out on a root at the start of the last wooded section. You can stay up-to-date with the team’s progress, including full race day reports, on their Facebook page here.